The StarTech PCI Express SuperSpeed USB 3.0 Card is both flexible and functional. It provides data transfer speeds up to 10x faster than USB 2.0.� It enables you to access your data and transfer files faster than ever, by adding one internal USB 3.0 port and one external USB 3.0 port to your PCI Express x1-equipped PC. Featuring a native NEC PCI Express host controller chipset, the new USB 3.0 standard supports transfer rates of up to 5Gbps. It provides connectivity and support for the older USB 2.0 (480Mbps) and 1.1 (12Mbps) devices. It supplies 5V, 900mA to the USB 3.0 port, permitting several external devices to operate without the need of an additional power source. The inclusion of an internal USB 3.0 connection provides the advantage for future USB 3.0-based internal storage solutions. 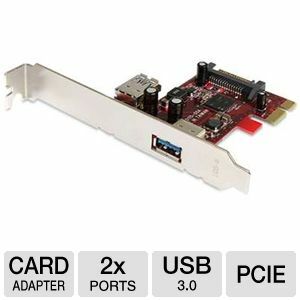 Order the StarTech PCI Express SuperSpeed USB 3.0 Card straight away.